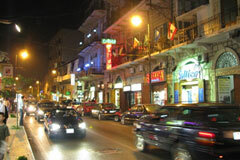 Aley is a picturesque City in Mount Lebanon. It is located 17 km uphill from Beirut, just south of the summer resort of Bhamdoun and north of the strategic town of Souk El Gharb. 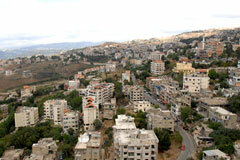 Aley is a major tourist destination in Lebanon and the Middle East. 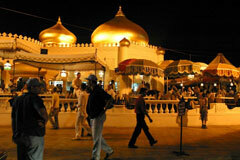 Its location and climate made it a favorable venue for shopping and dining, especially for wealthy Arabs from Persian Gulf states. This resort town with its increasing number of tourists and visitors has become one of the most flourishing resort towns in Mount Lebanon, and thus has garnered its historical name as "The Bride of Summers". The "Souk Aley" is a relatively long boulevard lined with palm trees; there are numerous redroofed stone houses erected on the east side of the street while several street cafes, outdoor restaurants, and nightlife pubs occupy its western side. In addition to these, there are tens of antique shops and retail boutiques along the street, which forms the heart of Aley. Aley also hosts a well-known casino. In 1910 Aley received the founders of the American University of Beirut (AUB), they built castles and lived there for several years. During the 1960s several artists performed in the hotels and the casinos of Aley such as Umm Kulthum, Mohammed Abdel Wahab and Farid Al Atrash.